Luckily, we still have some summer produce to cling on to the last whisper of summer. 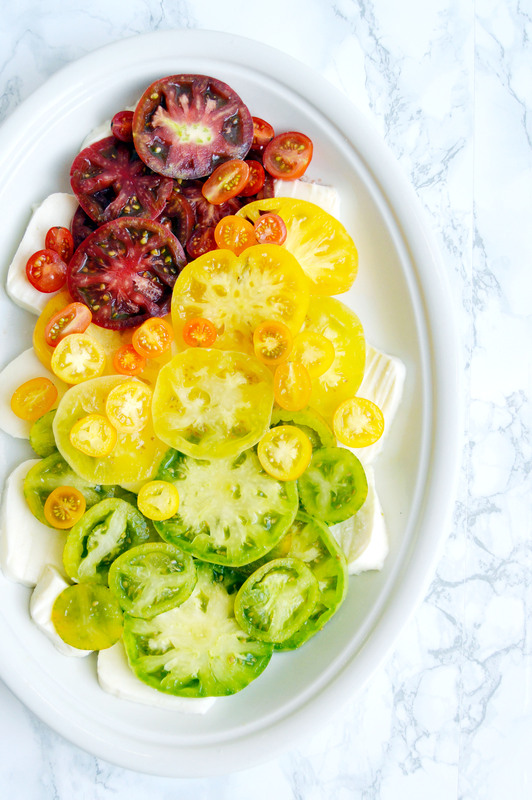 I found some heirloom tomatoes at Trader Joe’s this past week and they were available in so many different hues that a rainbow was the first thing that came to my mind. I’m almost embarrassed to say that nearly every ingredient that I used in this recipe is from Trader Joe’s (even the paprika! ), but imo a one-stop shop is always good news. 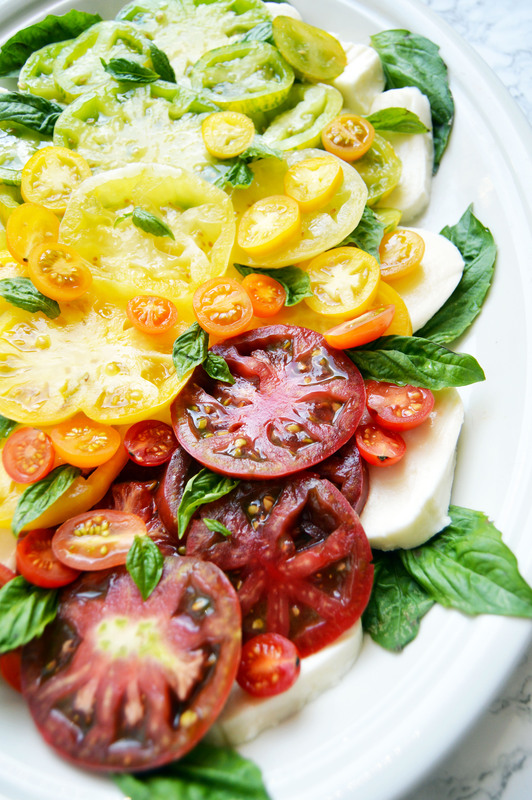 I love Caprese salad because it’s a solid balance of flavors. But more than half of the time, I’m disappointed when I order it in a restaurant. 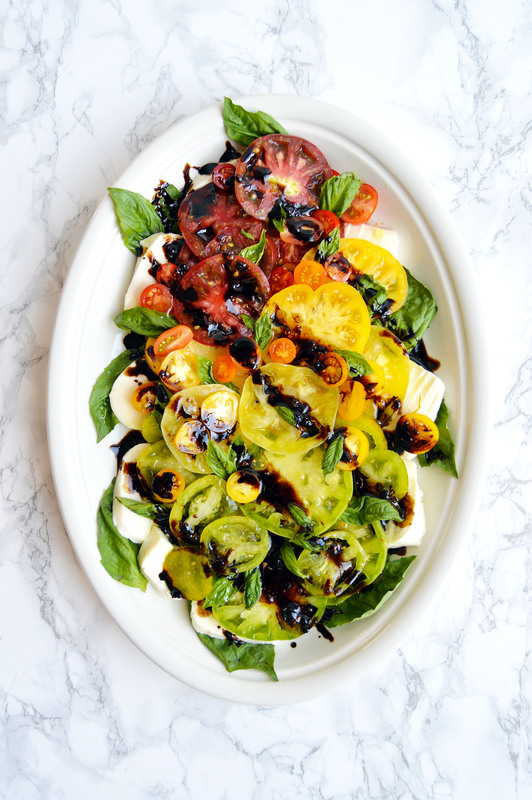 The ratio to tomato, cheese, basil and balsamic glaze is usually off. I suppose everyone has their own idea of what makes the perfect ratio and that’s why making it at home is the best option all around. (It’s usually cheaper too.) 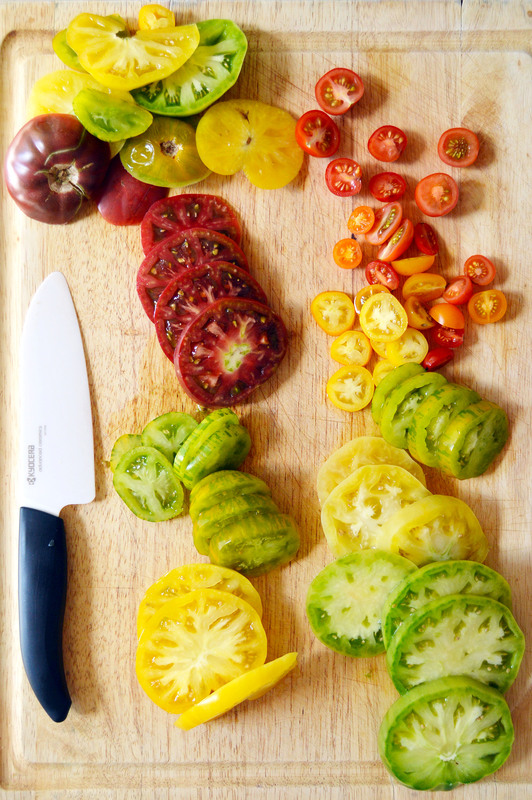 Heirloom tomatoes are super sweet and juicy so you want to use a very sharp knife to slice them neatly. 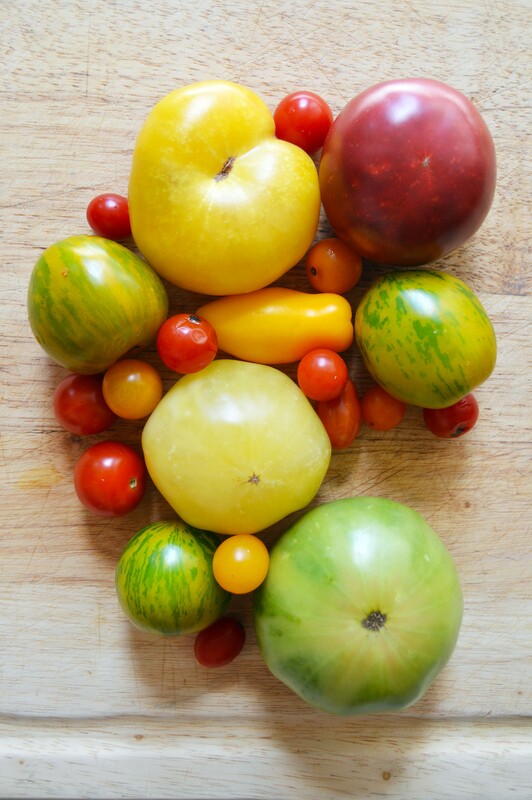 Tip: when cutting the little tomatoes, cut them vertically (from the stem end) to get the prettiest shot of the seedy insides. I wanted to balance the sweetness with a hint of heat and it turned out well. I may be biased because I love hot sauce on almost anything and everything. Even if you forgo the spicy glaze and opt for plain balsamic vinegar, it’s still delicious since vegetables + cheese = always tasty. Pick out the freshest leaves from your basil bunch. Save the tiny ones for garnish. Line the plate with basil leaves and top it with the mozzarella slices. 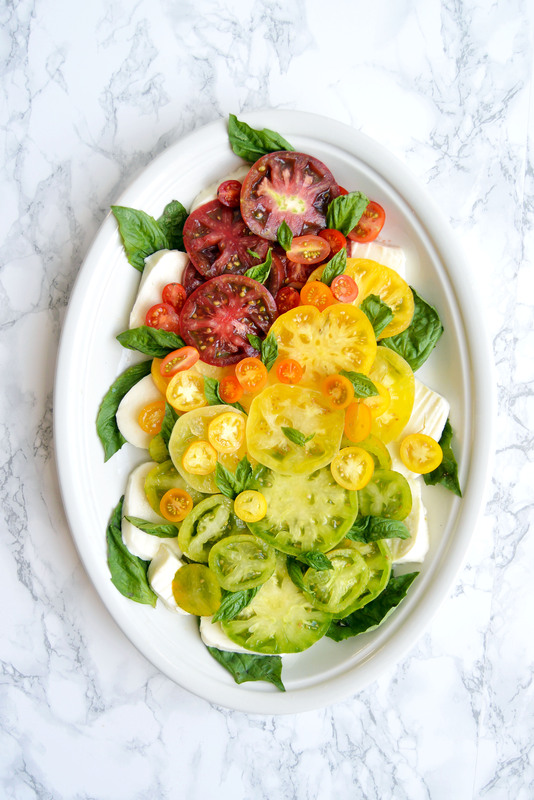 Arrange the tomato slices from red to green, starting from the darkest red. Put some basil slices in between the tomatoes. Sprinkle the tomatoes lightly with salt and drizzle the olive oil. 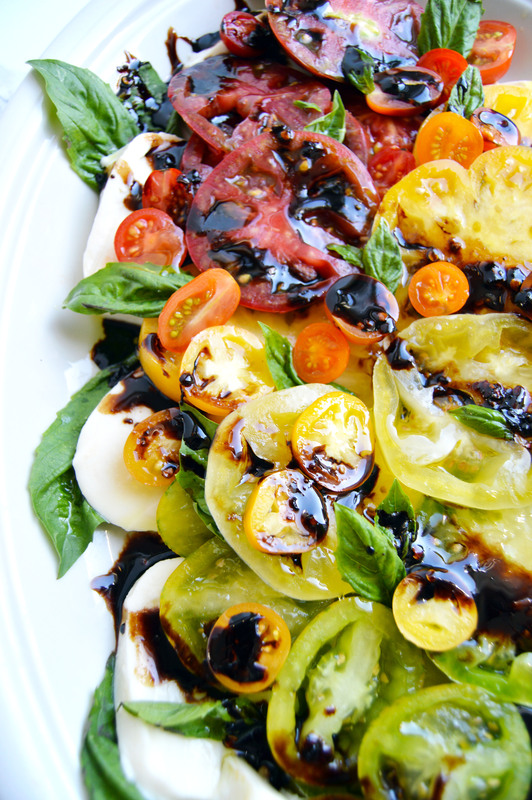 Drizzle the balsamic glaze and top with the remaining basil leaves. In a small pot, add ½ c. balsamic vinegar, red pepper flakes, paprika, sugar and as much black pepper as you want. Boil down the vinegar until thickened, about 3-5 minutes. Keep a close eye on it so that it doesn’t burn. Add ½ tbsp. balsamic vinegar to up the acidity that you lost. Cool and use as desired. This entry was posted in Appetizers, Salads, Summer, Vegetables and tagged basil, caprese, salad, Summer, tomatoes. Bookmark the permalink.